Jason Lensmeyer is a Mortgage Loan Originator licensed in both Wisconsin and Illinois. Jason graduated from Carthage College in Kenosha where he was a team captain and 1st Team All-American on the Carthage Baseball team. 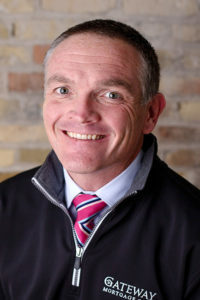 Prior to his employment at Gateway, Jason has worked for numerous large banks in Southeastern Wisconsin and an investment brokerage/brokerage house in Chicago, IL where he helped his customers purchase and refinance homes. He prides himself on a simple philosophy of building relationships and treating everyone as he would like to be treated. Jason chose to work at Gateway Mortgage because of their similar sense of community and family. He feels strongly that local processing, underwriting, closing, and servicing is a tremendous asset for his customers. Jason & his wife, Cara, have been residing in the Kenosha area for the past 15 years and have been blessed with four children including a set of triplets. During Jason’s free time he enjoys coaching his children’s various sports, watching a variety of sports but most of all spending quality time with family & friends.